I already had three bikes, but I needed a bike for a specific purpose. A bike that would carry me and my luggage quickly and reliably across the motorways of Europe, through the mountains of Greece and along the pot holed highways and the remote and un-surfaced byways of Eastern Turkey. 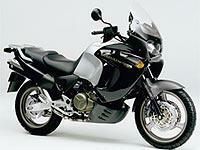 I chose the Honda Varadero. With 38 litre panniers and 45 litre top box, the Varadero cruised the motorways at 100 mph. Anything much above that and a slight weave set in, but with the Givi after-market screen - 3 inches taller than standard - and the rear suspension on the three-quarter position, it was a wind free, quiet and comfortable ride. The mountains of Greece required the suspension to be taken up a few notches - this can be done from the saddle - this sharpened up the handling. The linked brakes were something new to me and making more use of the foot break took some getting used to, but once you get the hang of it, it provides good and safe braking, especially on the unmade roads. The engine is a gem. At anything above 2000 revs, it just goes and once over 4000 revs, all you need is top gear. The Varaderos off-road ability is limited by its relatively high first gear and slipping the clutch becomes a necessity. The fixtures and fittings are typical Honda - they work! The exception being the Centre stand, sold by Honda as an extra. The sharp angle that the stand meets the road, together with long travel suspension makes it very difficult to use. Mind you, it does act as a good ‘bash plate’ when riding over rocks! The petrol consumption has varied from 32mpg on ‘fast’ motorways to 45 mpg, when ‘cruising’. Overall I get about 38 mpg. Tyres: Enduro4, Tourance, T66 - all have given some 9000 miles. The Distanzia I have at the moment suit the bike well and look like going to 10,000 miles. The chain was replaced at 30,000 miles, but it was actually the front sprocket that was worn. The chain would have probably gone to 35000 miles - the Scott oiler helps. The bike did let me down once. The cam chain tensioner spring broke at 10000 miles, whilst in Turkey - Honda had me back on the road within 48 hours, repaired under guarantee, with a free service, including oil and filters as a gesture of good will! Did I make a good choice - Yes. Would I buy another? I don’t think I will have to. This once was a retirement present to myself and I think it will see me out! Tyres : Front: 110/80 - 19"